True Confessions - I've never read The Mouse and the Motorcycle - nor am I completely done with it yet. We're about halfway through with this read aloud but it's somewhat slow going. I don't think Bookworm1 or I are very much connected to Ralph. He's a mouse, true, and we seem to be on a mouse kick these days. First we read Tumtum and Nutmeg, then I introduced my first born to the wonderful world of Christopher Churchmouse (who I hope to introduce you to soon, if you don't already know him.) A combination of things caused us to continue making mouse friends, nonetheleast of which was discovering that we were providing a home to our own little mouse! The Log House Mouse came visiting one Saturday morning when we opened up all of our kitchen drawers and discovered "someone" had been playing. 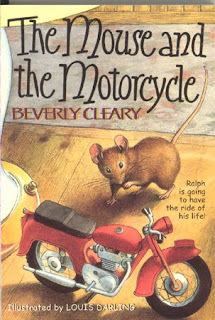 Admittedly, I wasn't sure if The Mouse and the Motorcycle was going to be a good for us just yet. It is a bit over my 3 1/2 year old's head, but he still manages to follow the storyline, and remembers where we are when we break between chapters. But I wanted to read this when I was offered a chance to choose an item from All Children's Furniture for review/play. 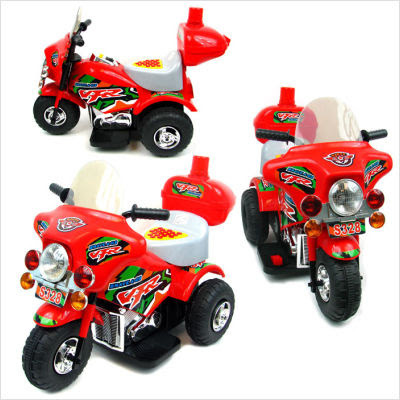 I enlisted the help of Daddy in choosing a toy for the Bookworms to enjoy this summer, and Daddy picked this battery operated motorcycle. Let me tell ya - Daddy knows how to pick toys that his sons will like and enjoy! I don't make it a habit to show pictures of my boys online anymore, but let me assure you that if I were to show you pictures with them on it, you would notice nothing but the smiles on their faces! Speaking to my interactions with CSN Stores and All Children's Furniture - I found to them to be very helpful and on the ball. My transactions with them went smoothly and they were very agreeable and enjoyable to work with. When the motorcycle arrived, it was missing the hardware necessary to put it together. I e-mailed my contact about it and customer service responded instantly and mailed the hardware to us immediately. No complaints there! The motorcycle was pieced together and presented to the boys and they have had fun riding it all over our house. My one year old hasn't quite figured out how to operate it on his own, but he enjoys crawling up on it. Bookworm1, however, is the master at driving and steering and enjoys gadding about with his little brother chasing him and laughing from behind. The motorcycle runs well, and the battery lasts for a long time. You just plug it into the wall for a recharge and you are good to go again. The picture accurately represents that the item looks like. Sometimes, it's really fun to surprise your kids with things like this and so Daddy and Mommy offer their thanks to CSN Stores for the opportunity to check out their company and play with a fun toy! Despite the motorcycle as incentive, Bookworm1 isn't terribly concerned about finishing up the Ralph story. Occasionally he'll ask me to pull it out and read a chapter, but his attention waxes and wanes. I think it probably would have been a better story to read at age 5 or 6, but since I'd never read it either, I don't mind pressing through it in a leisurely manner. Tumtum and Nutmeg still rank as our favorite mouse friends, but we're open to others who hold the same high standards of keeping homes clean and children cared for. No chewing through linens and towels allowed! You never cease to amaze me...two reviews in one! I can't wait to hear about Christopher Churchmouse. I really like CSN stores too! Your motorcycle looks like fun. Glad your little Ralph is gone! My mom read this series aloud to my siblings and I when we were growing up. We loved it. Give your boys a couple years and I think it'll be received better. Stephanie - I am a good mother. So yes, of COURSE I made the motorcycle noises. ;D haha. And yes, I'm fine with either waiting to read this book, or just continuing to plug along at a very. slow. pace. We never read the book, but we loved the video with a young Fred Savage. My youngest loved the Christopher Churchmouse books. I've never read this, but my boys are reading it right now!